Election 2019: Maneka Gandhi Gets Notice For Telling Muslims "Vote For Me Or Else..."
Election 2019: Union Minister Maneka Gandhi later clarified that her words had been twisted. 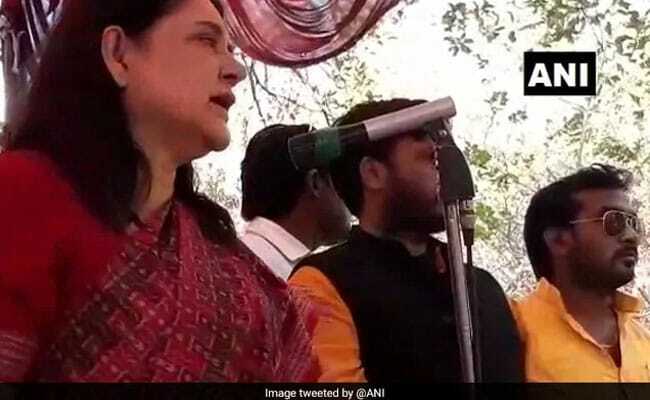 Election 2019: A 3-minute clip of Maneka Gandhi's speech in Sultanpur was shared on social media. Union Minister Maneka Gandhi was served a show-cause notice by the District Magistrate of Sultanpur, from where she is contesting the national election, and a report has been sent to the Election Commission after she was seen on camera telling a gathering of Muslims to vote for her or else she may not be inclined to be responsive to their requests. "I have already won this election, now it is for you to decide," the BJP leader could be heard saying on Thursday. "The Election Commission has taken cognisance of the matter. District Magistrate, Sultanpur has issued a show-cause notice to her and a report has been sent to the poll body," BR Tiwari, Additional Chief Election Officer said. Maneka Gandhi, later on Friday, clarified that her words had been twisted. "I love Muslims and I had myself called a meeting of the BJP's minority cell. I only meant to say that I am winning the elections and their participation would be like 'daal pe chaunka'." The Congress termed Ms Gandhi's statement "scandalous". Party leader Randeep Surjewala said should be a strict action and that the minister should be sacked for her remarks and for "dividing people".